Plenty of Boston fans were counting the Yankees out and Boston the AL East Champs three weeks into April, as on April 20th, Boston owned a 17-2 record with the Yankees having a 9-9 record. The next few series for Boston contained bottom of the barrel teams such as Tampa Bay, Kansas City and Texas, while the Yankees were going on a stretch against Minnesota, Anaheim, Houston, and Cleveland. I’ll admit, if I was a Boston fan I would be riding high too. However, with Boston stumbling against those teams, the Yankees took advantage as they sweep Minnesota, Anaheim and Cleveland while taking 3 of 4 against the reigning champion Astros. Including the beginning of the Boston series, the Yankees won 8 straight games against teams holding at least a share of first place. With Boston’s stumble and the Yankees stride against some of the top talent in the league, Boston came to town with just a 1 game lead in the AL East. In Game One of the Series the Yankees were lead by the bad man himself, Giancarlo Stanton. After slighting Boston during his trade conversations this off-season, Stanton is proving to be a Red Sox Killer already. On Tuesday night he homered twice off of Drew Pomeranz, who pitched well otherwise. On the other side, Luis Severino continues to prove himself as an ace as he gave up just two runs in six and a third with 11 K’s. The game was later tied by an Andrew Benintendi (my most hated player) single and a Mookie Betts triple (damn is Mookie good) in the 7th inning. 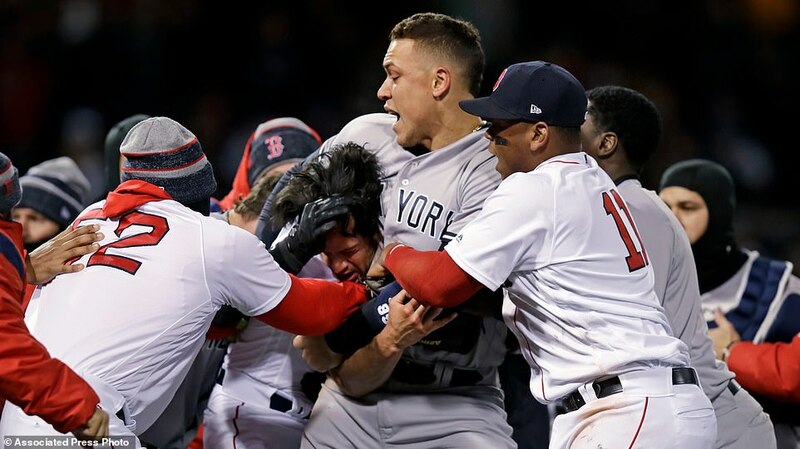 However, in the bottom half of the 7th, the good guy Aaron Judge punked slime ball Joe Kelly for the second time this season (previously put him in a headlock after Kelly danced away from fighting Tyler Austin last month), as Judge turned around a Kelly pitch for an RBI Single, and the Yankees would never look back, as Aroldis Chapman is still filthy and looked the door in the 9th inning. AL East Tied. Next up in Game Two of the series was Mashiro Tanaka vs Jersey Native Rick Porcello. I do not respect Rick Porcello. I played high school baseball against his alma mater on “Rick Porcello Field” and quite honestly it was one of the nicest fields I have ever played on. However, as a Jersey Native, how the hell can you play for Boston. Anyways, in game two, it wasn’t the pitchers duel we had expected. This game started off with an RBI single by Aaron Judge and then shortly later Boston took the 2-1 lead with Mitch Mooreland hitting a two run bomb off of Tanaka. But no need to fear the bad man was coming up. Giancarlo Stanton with a two run double off of Porcello in the bottom of the third inning to give the Yankees the lead. I think just to make me mad, Benintendi then hit a solo home run, to my disgust. Later in the Game, in the top of the 7th inning, Chad Green hung the worst slider I have ever seen in my life as Hanley Ramirez absolutely demolished it into the second deck in left field. Boston was up 6-5 heading into the bottom of the 8th inning, when huge Yankee fan Matt Barnes came in and put some runners on base, he was then relieved by Craig Kimbrel, who did not get the job done. After fighting off tough pitches, the slumping Brett Gardner sent a 3-2 pitch to the left-center field wall for an RBI Triple giving the Yankees a 7-6 lead over Boston. Want some insurance? Aaron Judge has got you. He sent a MISSLE line drive home run into Monument Park off of Kimbrel, which was hit 117 MPH (the hardest hit home run off of Kimbrel ever). That gave the Yankees a 9-6 lead, and again Chapman would close the door. Yankees take sole possession of first place in the AL East with a 1 game lead. Game three of the series ended up going to Boston. After gathering a 4-0 lead off of CC Sabathia, rain was in the forecast in the Bronx as there was a rain delay for about an hour. After the conclusion of the delay, in the bottom of the 7th, it continued to rain. Yankee Stadium rained down boo’s all over Joe Kelly was he came in with a 4-0 lead with the bases loaded and eventually got to watch the lead disappear. It was then 4-4 going into the 8th inning. Dellin Betances was dealing in the 7th, but Aaron Boone, who I am a fan of, needs to learn that Betances is a one inning pitcher. In three starts this season where he has pitched two innings, in the second inning of work he has given up 6 runs. In the first at-bat J.D. Martinez took Dellin deep to right just over the wall of the short porch (you just knew Betances was going to blow it in the second inning of work). I was curious to know, since every Yankee home run over the short porch doesn’t seem to count, does that JD homer count? Yes. It’s nice, right? Kimbrel then came on to close out the game for Boston. The AL East was then tied again. A very underrated part of the series, in my opinion that I wont let slide was, David Price is the most scared pitcher of all-time. Don’t tell me he was hurt. Don’t tell me he was hurt last month in Boston after giving up 4 runs to the Yankees in the first inning and leaving because his hand hurt. Gary Sanchez terrorizes David Price and he didn’t want to start. I’m very tolerant of injuries honestly, but anyone can see through Price right now. Blow up by the Yankees last month, then all of a sudden he was hurt and had to leave the game. Yes, he then made his next start. This time, his little fingers hurt again and didn’t even come to New York with the team as he missed his scheduled start against his best friend Gary Sanchez. Oh yeah, of course he is making his next start. I’d honestly take it all back if he missed either one of his next starts after his made up injuries, but David Price, everyone in the world sees right through you. This article will get some hate. That’s fine. I bleed pinstripes. It is May and I was screaming at the TV during this series. That is what its all about. I love my Yankees and will always back them, especially when its against Boston. However, let’s be real for a second. Both teams are great teams. Great lineups, great pitching, but I saw almost every power rankings earlier this week with Boston on top at number one. I will live with it because power rankings are irrelevant, but its time to stop lying to each other. Power Rankings shouldn’t be who has the best record (as Boston had a one game lead last power rankings), it should be the best team. You’ll realize I kept mentioning the AL East Standings after every game. However I need to mention, I do not believe that Standings in the middle of May matter. I don’t think they matter until late June, maybe even the Fourth of July. But Boston fans made me do it. Some Boston fans were planning a parade after being up 7.5 games and counting the Yankees dead. Three weeks later, AL East is tied. Just wanted to remind everyone how quickly those things change and how irrelevant standings are this early in the year. But, I’ll be the guy to say it, especially after going 9-9 while playing AWFUL baseball, and then going 17-2 in their last 19, against actually really fantastic teams, lets stop kidding ourselves, the New York Yankees are the best team in baseball.